To help you get ready for our Halloween Weekends I thought we’d share some common pirate terms. These should help you put together a nice, rounded vocabulary for your stay here at Lake Rudolph. Black spot: to be ‘placin’ the black spot’ be markin’ someone for death. Corsair: a pirate who be makin’ his berth in the Med-…Medi-…that sea ‘tween Spain and Africa, aye! Gentlemen o’ fortune: a slightly more positive term fer pirates! Pieces o’ eight: pieces o’ silver which can be cut into eights to be givin’ small change. Drop your “g”‘s when you speak and you’ll get words like “rowin'”, “sailin'” and “fightin'”. Dropping all of your “v”‘s will get you words like “ne’er”, “e’er” and “o’er”. Instead of saying “I am”, say, “I be”. Instead of saying “You are”, sailors say, “You be”. Instead of saying, “They are”, say, “They be”. Always speak in the present tense. – We be thanking http://www.yarr.org.uk/talk/ for the list. Arrrr, ye Salty Sea Dog! Rudolph be takin’ on a new character this Halloween. He be a little more gruff and rough around tha’ edges. A little more salty ye may say, as in Salty Sea Dog. And he be sportin’ a eye patch an’ sailin’ a great, grand ship. Yo ho ho! 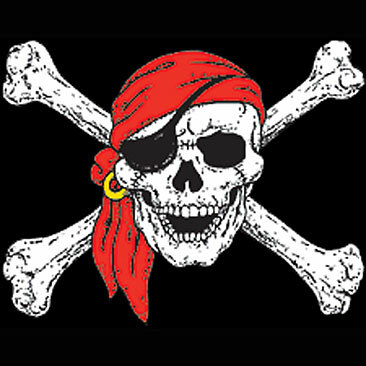 He be Pirate RedNose of Lake Rudolph … the most fearsome pirate ta’ sail th’ black seas! Aye, now there be a scurvy dog if I e’er saw one. Th’ scallywag be featured on th’ new Halloween T-Shirt, in full pirate garb. Make sure ta purchase one when ye arrive fer Halloween Weekends. They be available fo’ purchase in the Camp Store. Ye don’t have ta’ spend all yer booty; they be affordable for the whole squadron at $11.95 and $13.95 each, plus tax. And ye be havin’ a choice … short or long sleeve. Black, pre-shrunk 100% cotton T-shirts and they be available in these sizes: Salty Sea Dog (Adult), Matey (Youth) and Jim Lad (Toddler). 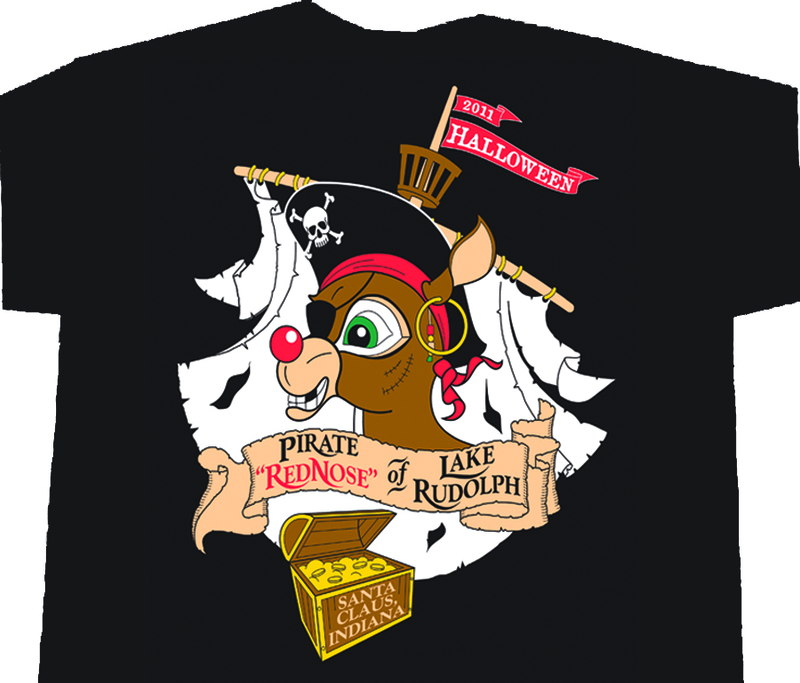 So … set yer sails fer Lake Rudolph … and we be seein’ ye at Halloween Weekends! Arrrr!